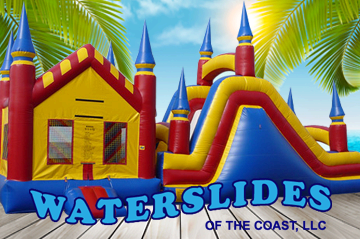 Waterslides Of The Coast is your one stop shop for bounce house rentals, waterslides, jumps, inflatables and obstacle courses for birthday parties, events and outdoor activities. We take pride in having the largest inventory of the most updated equipment on the coast of Mississippi. We service the areas from Biloxi to Slidell including Waveland, Bay St. Louis, Long Beach, Kiln, Picayune, Pass Christian and Gulfport. Our largest selection of jumps and bounce houses are available to rent 7 days a week and can most often be delivered with no additional setup fee. When we deliver an inflatable jump, spacewalk or waterslide you can expect a clean, up-to date piece of equipment that will make your party or event. Josh Desalvo is the local owner and is working hard to meet and exceed expectations. In business since 2006, Josh has seen almost all of his competitors come and go over the years. His dedication to quality of equipment, service and the customer experience has allowed him to grow. 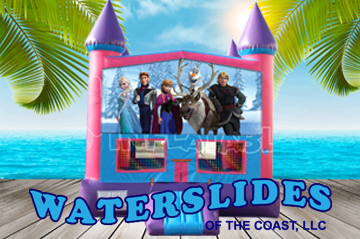 Waterslides of The Coast is the most trusted name for inflatable rentals by most of the families in your area. 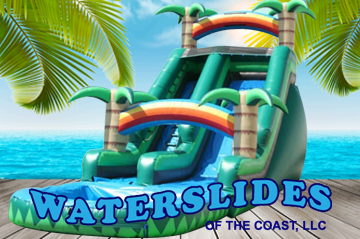 At Water Slides of the Coast we work very hard to achieve our primary goals; excellence in customer satisfaction, professional customer service, and the utmost care in safety. That's why you can count on us to be on-time, with exactly what your reserved, and every unit ready to go to work at your event. We love what we do, but we like to let our customers speak for us, to help you make the best decision when choosing your party rental company. Ordering online is as easy as ONE, TWO, THREE! Just click the link below and enter your event date and times. See what's available! 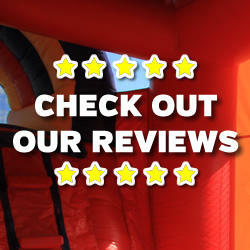 America's favorite event attraction, the inflatable bounce house! Reserve one today today and add a little bounce to your party. What could be better than having your bouncer feature your favorite cartoon and movie characters ready to welcome your little guests! 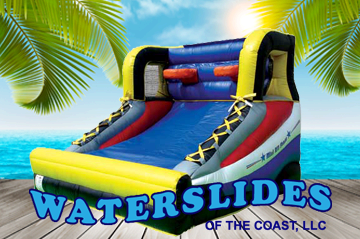 These units are great year round inflatables to rent. They are offer many exciting play aspects in the jumps ranging from slides to basketball goals. Find the right combo for you event. 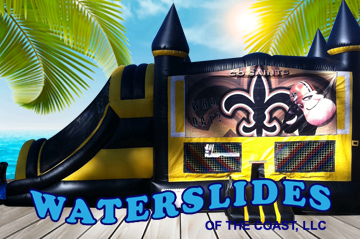 Water Slide rentals are our most popular units in the summer. 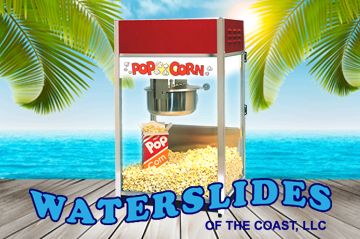 They are great fun and you can slide with water for a good time. 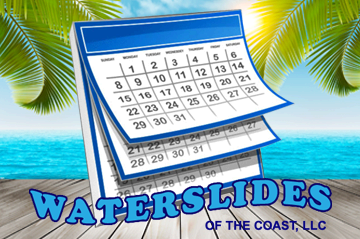 See our great water slide selection now! 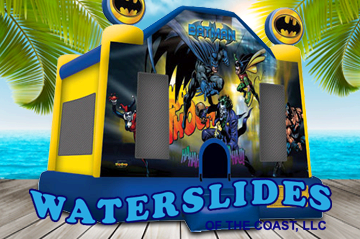 Bring the BIG TIME FUN to your event with our exciting inflatable game rentals. These big, colorful skill games are great for ages, and adds the spirit of fun and friendly competition. Our exciting Obstacle Course rentals are all the rage at picnics and parties. Anytime you can have kids running and climbing through the course, it will keep them busy and active for hours of fun. 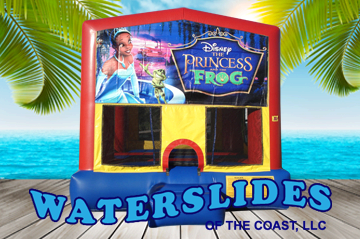 Water Slides of the Coast has a whole category of bouncers and combos with your little princess in mind. Classic castle designs perfect for a memorable princess party. Turn a good party into a great one, with one of our easy-to-use concession machine rentals. Fun food is a must have for any event. Units are cleaned and sanitized ready to work.